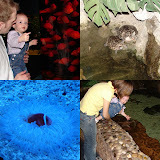 We took Anna to the Beijing Blue Zoo which is a small aquarium. It was a lot of fun because it was the first time that Anna was old enough to enjoy it. She was actually quite afraid of the fish at first. She would point at the fish and want to see them but when we brought her closer to them she we squeeze us tight. Once she put her hand in the water to touch the star fish she was not scared anymore. They also had a people mover through a tunnel where we saw lots more fish as well as mermaids! This aquarium is not anything compared to the BJ aquarium but it was small enough that by the time we finished Anna was too.